dblp: How is the dblp website organized? How is the dblp website organized? At the top level of the dblpweb page hierarchy, all journals are listed in the alphabeticjournal index, while conferences and workshops are listed in the alphabetic conference index. Both indices provide links to overview pages of the publication streams. In addition, overlay series like the LNCS series are listed in the series index. We also have a browsable alphabetic person index which links directly to the person pages. The next level of dblp pages are the so called publication streams, or venues. A publication stream summarizes the individual proceedings volumes of a conference series like VLDB or the volumes of a journal like TODS. Publication stream pages contain links to the tables of contents of the proceedings or journal volumes. Bibliographic information on the proceedings, information on upcoming events and pointers to Web pages of the publishers may also be integrated into a publication stream's page. 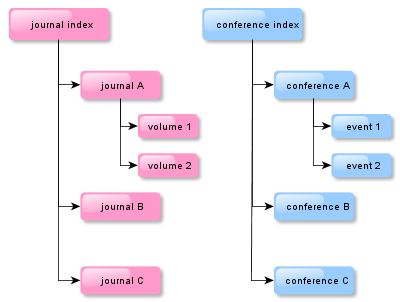 The tables of contents (toc) of a journal or proceedings volume (e.g.,Machine Learing 70 or ECOOP 2007) are the bottom level of the dblp web structure. Here, the bibliographic metadata for each article of the volume is listed, that is, the full list of authors, the title, the page numbers, and any available hyperlinks. If available, session titles and titles of special sections or issues are included into the toc pages. Back links to the publication stream level are also provided via breadcrumbs. Whenever a person's name appears on the dblp web site, that name provides a hyperlink to the author page of that person. Here, all identified publications of this person are listed. If the name auf the author is a known homonym, we do also provide links to all homonymous authors.